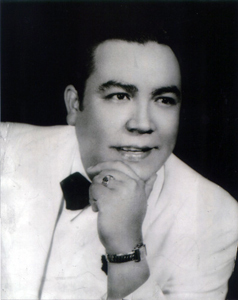 LALO GUERRERO, internationally recognized as the “Father of Chicano Music”, wrote hundreds of songs during his seven-decade career including the classic bolero Nunca Jamas and Cancion Mexicana, considered the “unofficial anthem” of Mexico. At the height of his recording years in the 1940s and 1950s, he dominated the Latin American charts in the U.S. and Latin America as a vocalist and songwriter with as many as three hits in the top ten at the same time. 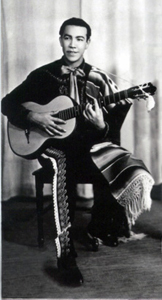 Many major Mexican stars covered his songs including the original Queen of the Ranchera, Lucha Reyes and the legendary Trio Los Panchos among them. Celebrating his bicultural roots, the Tucson, Arizona-born artist was an early pioneer in writing and recording bilingual songs and was the first to bring American swing and boogie to Spanish-language music in the ‘40s with a string of hit records. Luis Valdez re-discovered them in the late ‘70s and Los Chucos Suaves and Vamos A Bailar were performed in his acclaimed musical play and film, Zoot Suit. 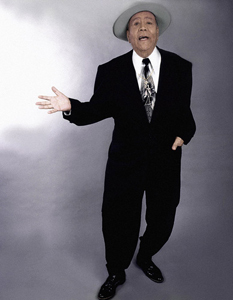 The Smithsonian Institution declared Lalo Guerrero a National Folk Treasure and his countless other honors include induction into the Tejano Hall of Fame, the Mariachi Hall of Fame, the Arizona Entertainment Hall of Fame, the Alma Award for lifetime achievement, a National Heritage Fellowship award and in 1997, the National Medal of Arts from President and Mrs. Clinton for a Lifetime of Creative Achievement, the first Chicano to receive our nation’s highest arts award. The music legend’s recordings for children include over 25 albums of Las Tres Ardillitas and the 1995 Grammy Award nominated Papa’s Dream, a bilingual children’s recording made with Los Lobos. He made his European debut in 1998 at the Cite de la Musique in Paris, France at the age of 82. His final studio session was for Ry Cooder’s Chavez Ravine CD in 2003 recording his now-classic Barrio Viejo, a nostalgic look back at his old Tucson neighborhood written in 1990. An award-winning documentary, Lalo Guerrero The Original Chicano, recently aired nationally on PBS stations and his memoirs, Lalo: My Life and Music, was published by the University of Arizona Press. The Lalo Guerrero Collection has been established in the California Ethnic and Multicultural Archives at the University of California, Santa Barbara. The beloved artist continued to make television and concert appearances throughout the country until just months before his passing in Rancho Mirage, California on March 17, 2005 at age 88.